This post compares the various Washington, DC bus tour options available to you, from hop-on-hop-off to more premium shuttle bus services, even a free, self-guided option. If you want to take control of your trip around the city, a hop-on-hop-off bus tour is highly recommended. These services typically provide both reliable transportation and either live or pre-recorded commentary (in up to 11 languages) about the locations you will be visiting. Stop at dozens of locations and get off to explore the area for yourself. Once you are done exploring, another bus will come along and take you to the next location you would like to visit! These tours make great companions for our pay-what-you-wish walking tours. There are 4 main companies to choose from and we have listed the companies in the order of best reviewed, though most of them have good overall review profiles. Complaints about wait times, particularly in the high season, are shared among the companies. This hop-on-hop-off route visits the National Mall and the downtown areas of DC to stop at the main sites. They have stops at 22 different locations that you can explore with either a 24 or 48-hour pass. Tours are led by live tour guides. Highlights include the White House, Arlington National Cemetery, FDR and Martin Luther King Jr. Memorials, the Lincoln Memorial, the Washington Monument and more. A free night tour is included with every 48-hour pass! Get 10% off all DC Trails Tours when you book through us. With the discount and the free night tour on the 48-hour ticket, DC Trails is probably the best value of all the hop-on-hop-off services. DC Trails also offers non-hop-on-hop-off sightseeing bus tours in addition to this service. Offer hotel pick-up with advance notice. DC Trails is one of the most respected services on this list with a 4 ½ out of 5 stars rating on TripAdvisor, which is the best of the 4 companies. Many people describe this tour as a great value, stating that their guides are very friendly and informative. Others have gone so far as to say that this is the best way to see Washington, DC. There are a few negative comments here and there, but there aren’t enough of them to suggest many common issues. These open-air but covered historic trolley cars take you around the city with a driver/guide narrating the entire way. You’ll have the option to hop on or off at various locations and explore the area at your own pace. They do provide plastic window coverings for less than ideal weather, and some of the newer trolleys are raised so you’re sitting above the cars. From this vantage point, it’s a lot easier to see all of the notable sites around Washington, DC! Hotel Shuttle Service provided at select hotels and times. Tours are only in English. This route takes you around the National Mall, Memorials, and Downtown DC. Old Town Trolley offers a free shuttle to Arlington National Cemetery that is included in your ticket price on the blue loop. This is not a tour of the cemetery, but a shuttle that brings you to and from the cemetery parking lot. You can then hop on another of their vehicles for a trolley tour of the cemetery, but this costs extra. For more on how to visit Arlington National Cemetery once you’re there, check our Guide to ANC. 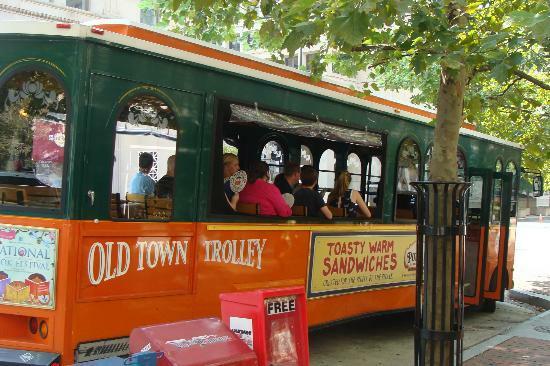 Old Town Trolley tours run on a continuous loop throughout the city. You can get a ticket good for one day or a two-day ticket. Two-day tickets do not have to be used on consecutive days. They also offer a 2.5-hour Memorials by Moonlight tour that begins at Union Station. All tickets include shuttle service to Arlington National Cemetery (cemetery tour is extra). Children under 4 are free. Includes Arlington Cemetery Tour and a Potomac River cruise. This tour company has earned a 4 ½ out of 5 stars rating on TripAdvisor and Get Your Guide (read the reviews). Thousands of passengers have had an excellent trip while on the Old Town Trolley, and that’s definitely a good sign. Although some guests have left negative feedback, few of their complaints indicate a common problem that anyone should be concerned about. A majority of reviewers have said that their guides provided a wealth of valuable information and made the journey very enjoyable. Big Bus, which operate double-decker, open-top brown buses, is a company you may have seen in other cities throughout the world. This tour has three different loops around the city depending on which areas you want to see. There are many connection points that will allow you to hop on and hop off any of the lines! The official tour of the National Mall, stopping at the major Smithsonian Museums and the Nation’s famous monuments and memorials. The tour features live, English-speaking guides, alternating with pre-recorded commentary and is available in 8 languages. A recorded commentary route that crosses the Potomac River, introduces you to Arlington National Cemetery and Pentagon City. This route also has prerecorded commentary in English, French, German, Italian, Spanish, Brazilian Portuguese, Mandarin Chinese, and Japanese. The Yellow Loop has only an English-version of recorded commentary taking you through the historic Georgetown neighborhood and further northwest to the National Zoo and National Cathedral. There are a few different ticket options for the Big Bus Tours. Purchase your Big Bus Tour tickets here. Passes come in 1 or 2 days versions. All 2-day passes include free admission to Madame Tussauds Wax Museum. The Deluxe 2-Day Pass also includes a Potomac River cruise. $35 for children (5-15 years). Purchase your Big Bus Tour tickets here. TIP: Also going to NYC and interested in bus tours in New York? You can get a combination pass that includes access to Big Bus Tours in both cities! With a 3 ½ out of 5 stars rating on TripAdvisor, it’s fair to say that Big Bus Tours is a bit of a mixed bag for most customers. This rating, while lower than the previous two mentioned competitors, is aligned with what most hop-on-hop-off tours receive worldwide. This company is likely the cheapest of all options. This ticket is included at no charge with the purchase of the SightseeingDC Pass. Purple Loop: Arlington National Cemetery & Pentagon – This route does not take you on a tour of the cemetery, but rather drops you off and picks you up in the parking lot. For a tour of the cemetery, check out our Guide to Arlington Cemetery, where we also have a GPS-enabled audio guide. CitySights DC offers a 24 hour and 48 hours loop option. There are also shorter express and night tour options available. With 41 different stops, the best bet is the 48-hour pass. These double-decker bus tours offer pre-recorded commentary in 11 languages: English, French, German, Spanish, Italian, Korean, Mandarin, Japanese, Russian, Hebrew, and Portuguese! This ticket is included at no charge with the purchase of the SightseeingDC Pass. Hours: Buses run daily 9 am – 5 pm every 10-30 minutes depending on which loop. The Yellow Loop ends at 4 pm. Hotel Shuttle runs at specific times for particular hotels. Check here for more information. Unfortunately, this company has a far less stellar record than its competitors. Complaints range from poor customer service and guides to long wait times. This definitely isn’t a good sign for a hop-on-hop-off bus tour. That being said, they do have hundreds of 5-star reviews indicating that negative experiences may not be as frequent as they seem. Those who did enjoy their experience stated that their guides were highly informative. Positive comments also focus on all of the extras that you’ll receive with their 2 and 3-day tickets. If you’re looking for a good deal and willing to take a chance, CitySights DC could be a good option. Hop-on-hop-off bus tours are not for everyone, especially if you don’t like waiting for buses or you only have a short amount of time in DC. This section compares the various tours available in DC, from a small group (less than 11 passengers) to bus shuttle tours (up to 25-33 passengers) and coach buses (up to 55 passengers). Sometimes, the tours are what is referred to as driver-guide, where your driver doubles as your tour guide, which means that you will explore each attraction on your own. Other tours offer both a driver and a guide, where the guide will get off the bus with you at each stop and conduct a guided walking tour. Many of the options here include hotel pick-up and you will have the same bus and the same driver (and maybe tour guide) for the entire tour. One of the biggest advantages of these types of tours is that they are usually more in-depth than traditional hop-on-hop-off tours. They could be of great value if you are short on time, as it will take you much longer to see the same number of sights with the hop-on-hop-off buses. This may not be the best option for those who do like to take their time at an attraction. This company provides a variety of high-quality bus tours that will take you around Washington, D.C. in shuttle buses (up to 33 passengers). All of their tours include both a driver as well as a tour guide, and your tour guide will get off the bus and give you walking tours of each stop, while your bus and driver wait for you. In a sense, these are premium tours. Having both a driver and a tour guide means more cost to the company, and this is reflected in their prices. For some, this enhancement is well worth the premium paid, especially considering the reviews. With the exception of their night tour, most of their tours are 5 hours or longer. TIP: They also offer tours in New York City and you are entitled to a discount if you book tours in both cities. Interested in winning (2) Free Tickets to a USA Guided Tour Bus Tour in Washington DC? They are offering our readers a chance to win. Drawings held each week – sign up here. When we said these tours were high quality, we weren’t lying: this company has a 4 ½ out of 5 stars rating on TripAdvisor and Get Your Guide (read the reviews). Having the tour guide to guide you through the memorials is by far the biggest hit. This is their base tour. It begins at 10 am daily and lasts for 5 hours. This part-bus, part-walking tour includes guided stops at the U.S. Capitol Building, the White House, Washington Monument as well as the Lincoln and MLK Memorials and the Vietnam War and Korean War Veterans Memorials. They also offer a combination of this tour with a tour of Arlington National Cemetery for an additional $25/adult. Click here for the night-time version. Click here for their Arlington Cemetery Tour add-on. Find out how to get 20% off this combo tour. If you want to explore pretty much every notable monument and landmark in D.C. and take a 1-hour cruise on the Potomac River, then consider the Discover DC Tour. This 6 ½ hour tour will take you to all locations listed on their Highlights Tour plus: the World War II Memorial, the Franklin Delano Roosevelt Memorial, and the Thomas Jefferson Memorial. There is a lunch break included on the tour as you are cruising on the Potomac. During the winter, the Potomac cruise is substituted by a visit to the Pentagon City Mall food court. TIP: If you are planning on visiting NYC, you will get 30% off the Discover NYC Tour (normally $84) if you purchase it at the same time as your Discover DC Tour. You will need to call USA Guided Tours to confirm your NYC tour date. This tour is available for a 20% discount with the Build Your Own Pass. This 8-hour tour is actually the Discover DC tour above with a VIP add-on at the beginning and the end. You’ll meet your guide early for reserved tickets to tour inside the US Capitol Building. The 45-minute tour and film have reserved tickets so you don’t have to worry about it being sold out. After your day of sightseeing and boat cruises (summer only), you’ll be dropped off at the National Archives, again with reserved time tickets so you don’t have to worry about waiting in line. On this convertible mini bus – think open top minivan – you get to experience a guided tour with panoramic views without the glare of a window in the photos! A 4-hour guided bus tour takes you through both the highlights of Washington DC but also Old Town Alexandria and National Harbor, with its great view of the DC skyline and a chance to ride the Capital Wheel. Lunch and tickets to the Capital Wheel not included but you’ll have a break at the National Harbor to do both if you choose. Purchase your Skyview Convertible Bus Tickets. Bi-Partisan Tours uses much smaller buses (Sprinters) which seat no more than 11 passengers per trip. With fewer tourists to look after, it’s a lot easier to make sure that everyone enjoys their experience. Although you won’t have a tour guide get off the bus with you, these driver-guides do pride themselves on offering a unique and interesting look at Washington, DC. With the smaller groups, comes higher prices, but this will seem like a good trade-off for some. They do offer limited hotel pick-up and drop-off, which is a nice bonus. They also offer a nighttime tour. Morning DC Small-Group Bus Tour. 4 hours. The Morning DC Tour is sort of an early bird deal, giving you a chance to experience the best that Washington D.C. has to offer for a discounted rate. You’ll visit historic sites such as the White House, the US Capitol, the Abraham Lincoln Memorial, and the Thomas Jefferson Memorial. Each stop lasts about 10-20 minutes, giving you the opportunity to learn all about American history while seeing some of the greatest American landmarks up close! This tour is also offered as a nighttime tour. Dynamite Day Tour 6 hours. If you want to spend a bit more time exploring the nation’s capital, consider the Dynamite Day Tour instead. Running for approximately 6-7 hours, this trip will take you to several additional historic locations such as the Library of Congress, the Supreme Court, and Embassy Row. Tours are available every day, rain or shine. They also offer a nighttime tour. It would appear that most of their customers really appreciate the personal touch because Bi-Partisan Tours has a 5 out of 5 stars rating on TripAdvisor and Viator (read the reviews). Every other review is 5 stars, and many of them refer to these bus tours as a “must do.” Several passengers felt that this was the best tour in Washington, DC. Everyone seems to love their tour guides, and it’s not hard to see why when they can provide more of a personal touch thanks to smaller group sizes. Similar to USA Guided Tours, this well-reviewed tour company offers a shuttle bus with both a driver and a tour guide. With the good reviews come the higher prices. This company offers a 3-hour as well as a 6-hour version of a highlight tour. The tickets are one of the more expensive for this type of tours, but Signature Tours has one of the highest ratings of all the services on this list. With a full 5 out of 5 stars on TripAdvisor and Get Your Guide (read some of the reviews), you can feel fairly secure about a ticket purchase from this tour company. Arlington Cemetery Tours (operated by Trusted Tours) is the only company permitted to offer vehicle tours of the cemetery. They offer both open-air trams and enclosed vehicles for varying weather conditions. Several tour companies listed above also offer combination tickets that include an ANC tour. If you choose a bus tour ticket that doesn’t include the cemetery, then consider taking our walking tour as well as reading our GPS-enabled audio tour. More information or to purchase tickets. It looks like most of the guests who have taken this tour enjoyed themselves, as the company currently has a 4 out of 5 stars rating on TripAdvisor. Fortunately, few of the complaints had anything in common, so it’s not likely that these issues are indicative of a larger problem. If you’re hoping to experience both Mount Vernon and Arlington National Cemetery, this company offers a combo tour which includes a visit to both locations. Clocking in at a total of 6 hours, the trip begins with a journey to George Washington’s estate and finishes off with a guided walk-through of ANC. Prices are a lot higher than a trolley ticket, but you’ll also get a lot more bang for your buck. USA Guided Tours currently has an overall rating of 4.5 stars on TripAdvisor. The majority of reviewers absolutely adored this trip to Mount Vernon and Arlington. Some guests even indicated that their tour guides managed to keep younger visitors entertained throughout the excursion. This combo package is especially popular among families and couples. Want to see the Lincoln Memorial from land and from the Potomac River? Then the DC Duck tours are for you. This unique experience takes you around the city via roads and river, all without ever leaving the vehicle. From the moment you hop on this amphibious bus, you’ll begin to understand that this isn’t your average bus tour! With a live guide narrating the entire experience, you’ll hear great stories and even better jokes as you “waddle” your way around town. This is a favorite for families. Purchase your DC Ducks tickets here. Duration: 90 minutes. You do not get off the vehicle. Hours: Run Daily 10:00 am to 4:00 pm, every hour on the hour. Closed: Sunday of Memorial Day, the 4th of July and Marine Corp Marathon and November to Mid-March. DC Ducks has received an overall 4 ½ out of 5 stars rating on TripAdvisor and Get Your Guide (read some of the reviews). Only a handful of passengers have reported having a negative experience while on this vessel. Most people absolutely adore the Duck tours, stating that it’s a great way to see the city from both the water and the land. There is something truly beautiful about seeing the famous monuments and historic locations in Washington, DC all lit up at night. Thankfully, there are a lot of night bus tours offered by the services listed above. For those that we have listed above, we won’t repeat the company overviews. Tours range from large group double deck open-top buses to smaller, more intimate (and more expensive) shuttle buses. This 3.5-hour open-top bus tour will take you past all of the most iconic buildings in DC. 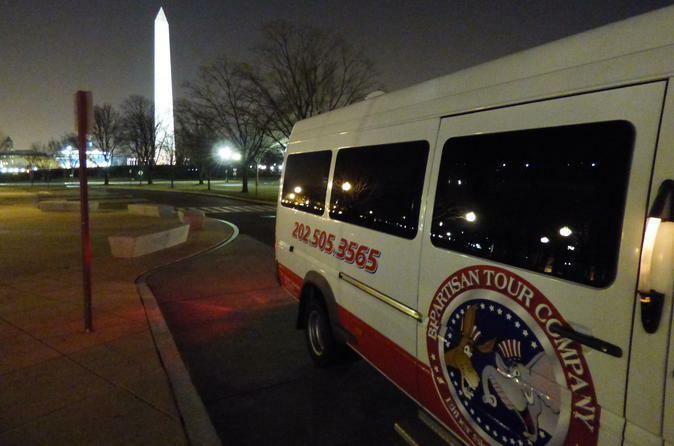 Of all the hop-on-hop-off companies, DC Trails offers the most stops of any similar night tour. Stops include the White House (Photo stop only), the U.S. Capitol Building (Photo stop only), Vietnam Memorial, Lincoln Memorial, Korean Memorial, Nurses Memorial, World War II Memorial, Iwo Jima Memorial, FDR Memorial, MLK Memorial. DC Trails Twilight Bus Tour offers a live guide who will get off the bus with you at each stop. Combined with our discount, this is also the cheapest of the night tours. In our opinion, this is the best value night tour (other than ours). DC Trails gets good overall reviews and that also goes for their night tour, which guests rate highly. 3.5 hours departing daily at 7 pm. Get 10% off the prices below (discount is deducted automatically). Purchase or get more info. NOTE: This night tour is included for free with the purchase of a 48 hour DC Trails hop-on-hop-off ticket. USA Guided Tours is one of the better-reviewed bus tour companies in DC. 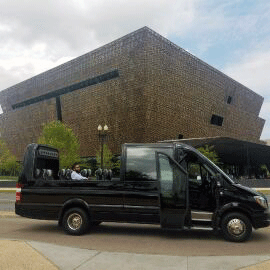 The DC at Dusk Tour has both a driver and a tour guide and your tour guide will join you for guided strolls through each stop, which is helpful as sometimes the sights cannot be fully experienced from the road. This is a premium service with a maximum of 30 guests per tour and thus reflected in the prices. Hotel Pick Up can be arranged via select hotels, otherwise, you can meet your tour at the Naval Memorial conveniently located downtown on Pennsylvania Ave NW – there is a Metro station right there on the Green/Yellow lines. 3-hour tour departing at 7:30 pm. This two-hour tour begins just after the sun goes down, allowing you to see what the nation’s capital looks like after dark. Unlike their other offerings, the Big Bus Night Tour includes a live guide that will explain the significance of every landmark on your journey. The night tour is not a hop-on-hop-off tour like their day tours, rather you will see most of the sights listed on their page from the bus. However, the tour does include 1 stop where your tour guide will accompany you to the Lincoln, Vietnam, and Korean War Memorials. Reviews of Big Bus’s night tour are better than the company as a whole. This is probably due to the fact that passengers are guaranteed one bus for the entire evening and will not have to wait for the next bus, as they do with the daytime hop-on, hop-off tours. NOTE: The night tour is included in the price for the 2 days all-inclusive ticket, which is just $20 more per adult. In addition to their hop-on-hop-off National Mall and their Arlington National Cemetery trolley services, Old Town Trolley also offers a night tour. Professional guides will lead you around the city and provide a plethora of information about the history of our nation. This is not a hop-on-hop-off tour, rather you will make 3 stops with your tour guide, as opposed to Big Bus’s 1 stop, including a stop at the Iwo Jima Memorial. Old Town Trolley also offers shuttle service from certain hotel areas to the tour starting point, which is a nice addition. Like Big Bus, Old Town Trolley’s night tour gets good overall reviews. Complaints seem to be the chaotic boarding processes and plastic windows, but the vast majority rate this tour very good to excellent. Discover all of the most significant locations in DC during the evening! There are a few good points for this tour. First, it’s a small group (up to 11 people) tours. Second, Bi-Partisan Tours is one of the highest rated tour company. Third, this night tour visits the Air Force Memorial, which most other companies don’t do, and this stop is a real treat at night. However, this is a driver-guide only tour, so there is no tour guide to accompany you through the memorials which can be a negative if you have any questions while at the sites since many sites cannot be seen from the coach. With that said, none of the reviewers seem to have any issues with this aspect and the guided bus portion seems to make up for it. They do offer hotel pick up and drop off. As the tour is a small group, they do allow flexibility with the itinerary and are sometimes are able to incorporate a specific request like Embassy Row or the Kennedy Center. 4 hours starting at 7 pm. Several DC bus tour operators offer bus tours to Mount Vernon Estate, the home of George Washington, which lies 16 miles (25 km) south of the District of Columbia. Other tours will visit Thomas Jefferson’s Monticello as well as Gettysburg Battlefield Park. Additional popular day trips from DC include Yorktown, Colonial Williamsburg, Harper’s Ferry, NYC, and vineyard and winery tours. There are a few bus companies with regularly scheduled tours from Washington, D.C. to Mount Vernon. Expect the tour to last 5 – 6 hours round trip, unless the tour includes a stop in Arlington National Cemetery, which will add 2 hours to the trip. Most tours pass through Old Town Alexandria for a quick view. Be sure to read our guide to Mount Vernon Estate before you go. It is also possible to take mass transit to the estate as well as a boat cruise. NOTE: Entry to Mount Vernon is included for free with the purchase of the Explorer Pass, a tourist attraction discount pass. In addition to their hop-on-hop-off and sightseeing bus tour services, DC Trails also offers a bus tour to Mt. Vernon Estate. Departs every day at 11 am and it last 5 hours round trip. Get 10% off these prices (discount is deducted automatically). Much like Gray Line, this company also provides a combo tour to both Arlington National Cemetery and Mount Vernon. The total trip will take you about 6 hours to complete, and it begins with a visit to George Washington’s estate. With the help of a professional tour guide, you’ll have the opportunity to explore and discover many of the significant landmarks located in and around Mt. Vernon. Your journey into the past will finish off with a guided tour of ANC, one of the most historically important cemeteries in the United States. Prices for this combo package are actually a lot cheaper than the competition, and USA Guided Tours has very good ratings on TripAdvisor. For more information about this service, please read our section on Arlington National Cemetery tours above. Mount Vernon & Arlington National Cemetery plus DC in a DAy – Visit Mount Vernon and Arlington National Cemetery on Day 1 and then take a full day tour of Washington, DC on Day 2 (or vice versa). Gettysburg – A full day visit to this historic national battleground memorial. Use our Guide to the Circulator’s National Mall route as a self-guided bus tour of the memorials and museums.